Home » Blog » Posts » Jambo! Jambo! After hearing horror stories of the potential for traffic jams and flight delays in Dar es Salaam we sped through the traffic to the Jakaya Kikwete Cardiac Institute in the Muhumbili National Hospital with no problems at all. The first thing to hit us was the extraordinary heat and humidity, followed by the warm welcomingsmiles, and the joy in each greeting “JAMBO”, as we were escorted through the hospital by the charming Executive Director, Prof Janabi. The overall feeling was one of “KARIBU” – you are most welcome here, please make yourselves at home! 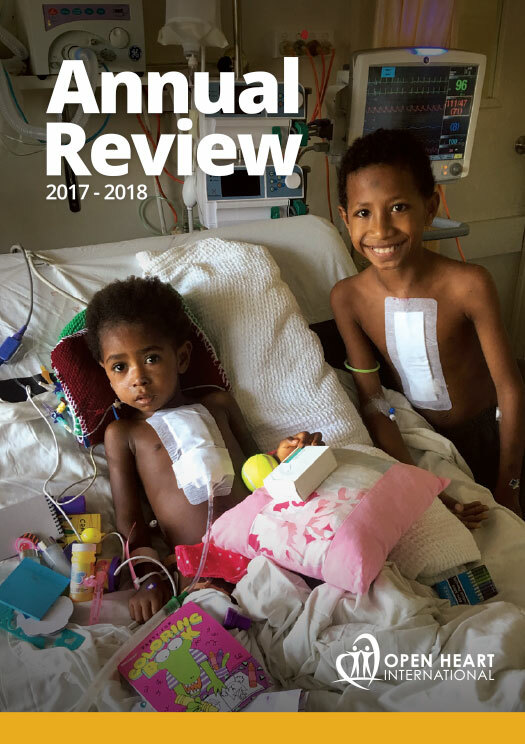 My immediate impression was that Open Heart International (OHI) appears to be very popular at Jakaya Kikwete Cardiac Institute. I am lucky enough to be tagging along with this hand-picked team of medical professionals, whopull togetherwith a “whatever it takes” attitude,paying their own expenses and using their annual leave towork long hours along side the Tanzanian medical team. Every OHI program is unique to its country’s needs. This particular project has an experienced team of nearly 30 medical professionals who not only help save numerous adults’ and kids’ lives twice a year by successfully performing complex open heart surgery, but they assist in training the local surgeons, cardiologists, sonographer, anaethetists, intensivists and theatre, Intensive care and ward nurses. This is considered by one and all paramount to the success of the program, and at the heart of what the team come to achieve. 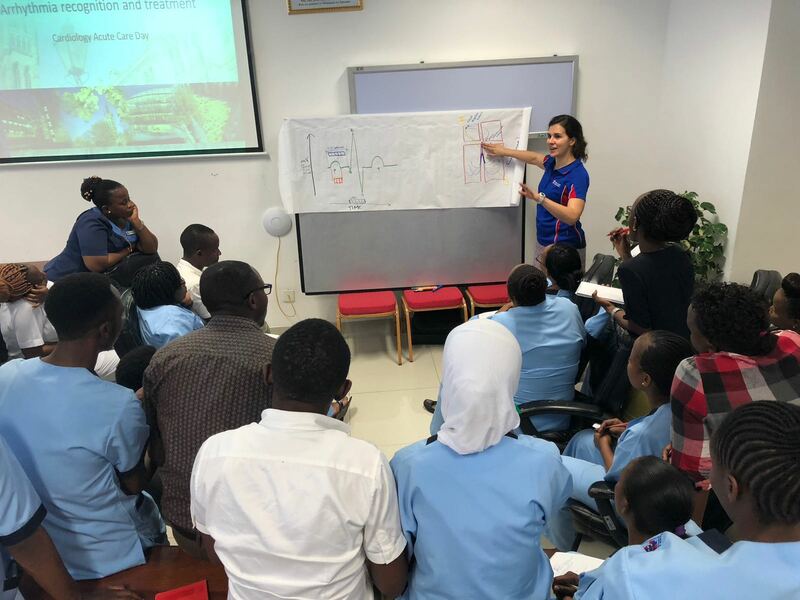 Two skilled ICU nurses Kate Munro, and Kiasha McInnis (K2) volunteered to come across a week early in order to run a training programin ‘cardiothoracic critical care nursing’ for 30 newly recruited nurses working at the institute. I was fortunate enough to be around to photograph and enjoy the course feedbackon the 5th and final day of training. There was plenty of clapping, songs of praise, and heartfelt expressions of thanks to both Kate and Kiasha for generously sharing their expertise. 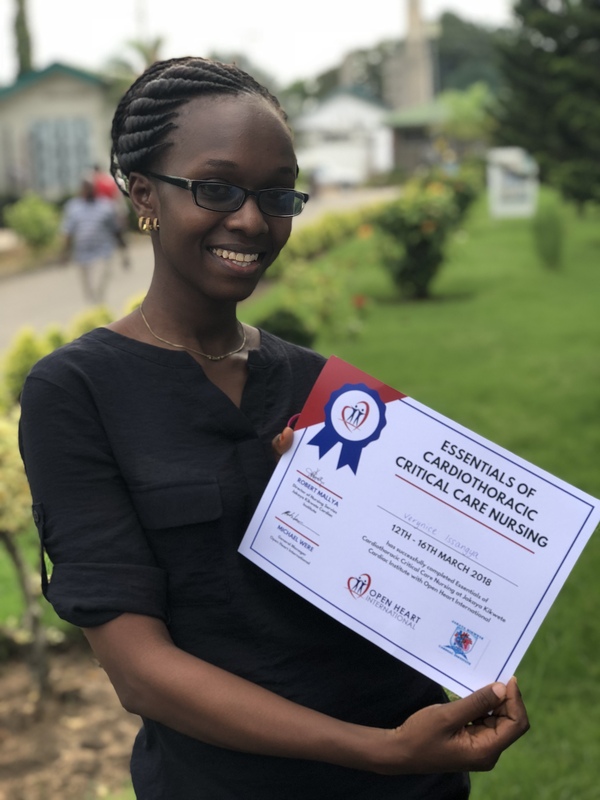 One nurse whose name is Verynice (photographed proudly holding her certificate), said “Thanks to you I now have the confidence to do my job.” Another couple sang ” Nursing is the light of God”, and others sang “we thank you, we love you”. Using all their energy, expertise and humour our two Australian nurses did an awesome job of getting this week off to an excellent start and doing us proud! 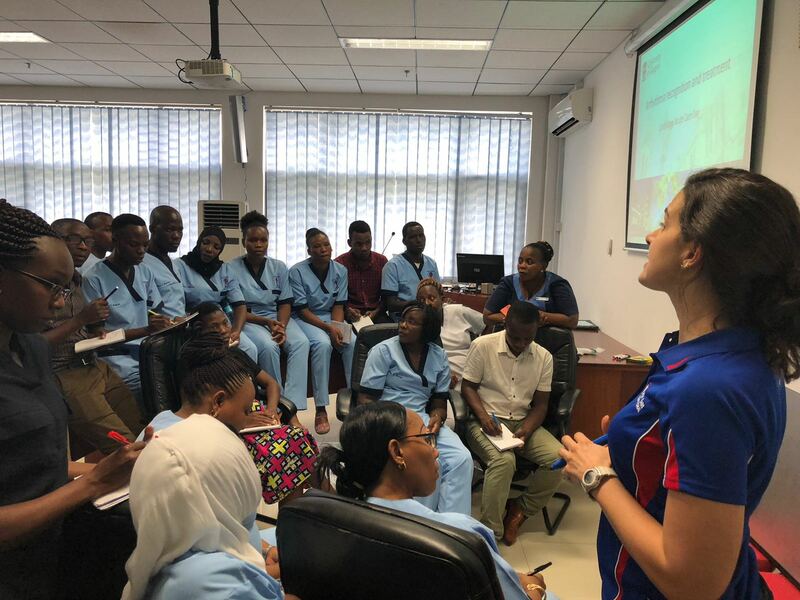 In return they were given personalised scrubs, so that they can match all the local nurses’ uniforms, and come Monday they willbe working together as one to get the job done – come what may. I will keep you updated as the week progresses.